The first napkin roll you need to make 6 rolls. 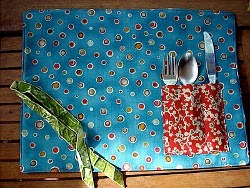 The 2nd project you make 4 placemats for the flatware. 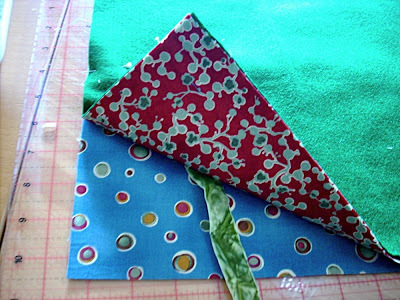 Start by cutting your top and backing fabrics into 18″ x 16″ rectangles. I got 6 rectangles of each fabric from 1 1/2 yards of fabric. Cut two lengths of ribbon 12″. Take the two cut ribbon and lay one on top of the other, then center them on the back fabric (right side up) along the left long (18″) edge of fabric. Though it’s hard to tell from the picture, there are 2 pieces of ribbon. Pin into place. Lay the top fabric into place on top, right sides together, and pin into place. Using a 1/4″ seam, then stitch all the way around, leaving a small opening to turn. Clip the corners. And turn right side out. Once turned, press well. 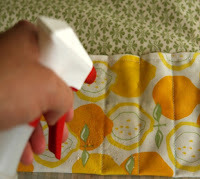 Stitch all the way around the napkin, using a scant 1/4″ seam. This gives it a finished look and closes the opening. With backing fabric facing up and the ribbon on the left side. Fold the bottom of the fabric up about half way. If you have your flatware handy, test to make sure it’s a good fit. Pin into place. Stitching on top of previous the seam, stitch into place. Be sure to back stitch at the top. 1 1/2″ from the seam, mark a line for the first flatware pocket with your fabric marking pen. Measuring from that line, mark again 1 1/2″ over and 1 1/2″ over again. You should have three lines. Stitch down the marked lines. Be sure to back stitch each time at the top. A little spray and press, and the Mark B Gone is gone. Cut the ends of your ribbon at a diagonal. Seal the ends of your ribbon Fray Check. Just add your flatware. Fold the top down over the flatware. And roll ‘em on up. Fold edges of pocket and top stitch. Stitch pocket to fabric around bottom and side edges. Then sew 3 small pockets from top to bottom for cutlery. Place both cotton fabric right sides together and felt on top. Place ribbon folded in half in between the cotton fabrics. Pin edges. Stitch all around the fabrics leaving a 3′ opening on one side to turn placemat inside out. Turn placemat inside out and iron well. Then top stitch close to the edge. 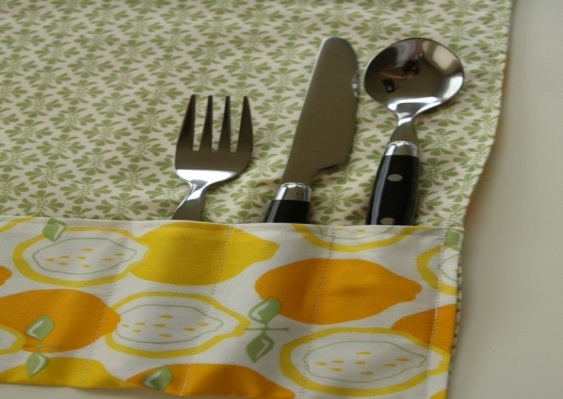 Roll placemat before storing away. Manly Walker Caddy to Crochet! Happy Father's Day to one and ALL! Gifts to Sew for Father’s Day!